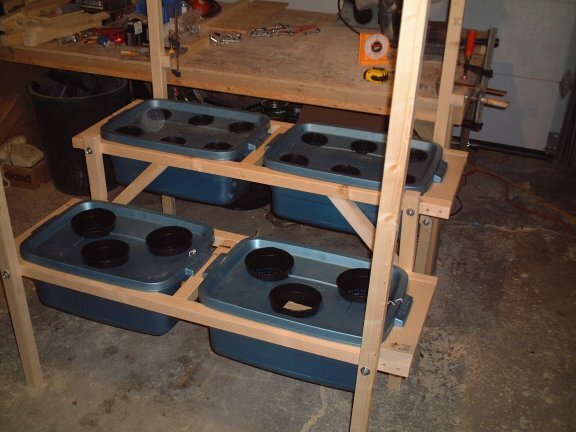 Many hydroponics enthusiasts like to build their own hydroponic systems so they can customize each part for their individual growing needs. 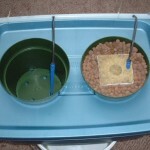 One of our forum members posted some great information and pictures of his setup that we wanted to share on the blog. I came up with the compass cutter from a tool I purchases to draw 6 foot radius circles for a stained glass church window I made. The tool is designed to hold a center point pin and lead that is used for a Schaffer mechanical pencil. The tool fits on a yard stick I modified it by taking the lead out and replacing it with a finishing nail sharpened on the end used to score repeatedly the rubber maid lid till it cut 1/2 way through, then it was scored from the other side till it caused the cut out to separate from the lid. The rubber maid material is easy to score like this – but if you try to use a drill, spade bit or hole saw it will fail, and rip the rubber. 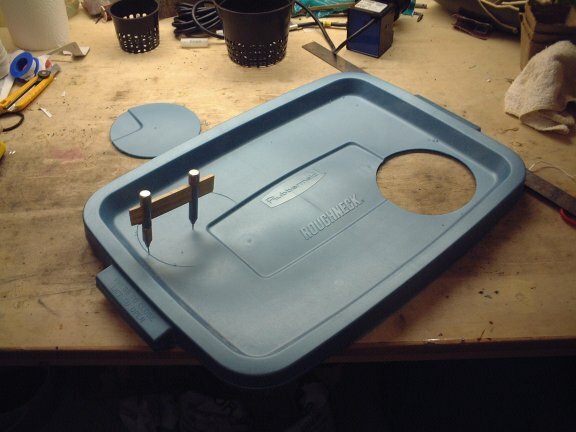 It might be possible to hole saw it if the lid is sandwiched between plywood to this catching and ripping. Test holes after each cut. I give the holes a light sanding to remove any left over debris from the cut. A spade bit the one that has tabs on the outer edge of the bit that cuts in about 1/32″ almost and the thickness of the material. The thickness is about 1/8″. So if you cut a little from the front, then a little from the backside it will produce a perfect hole and not rip the container and set you back a few bucks. Note there was no material removed from the center of the hole, be gentle. 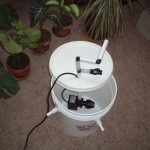 Pictured below is a very handy fitting for connecting a leak proof drainage hole. Make sure you have 2 rubber washers on the inside of a container with a curved surface – this aids the seal on the curved surface. I apply a little bead of silicon to the surfaces that will come in contact with the inside surfaces, this includes between the washers. On the barbed x thread x flange fitting the big white fitting here – for lack of a name…I will place some silicon then add the rubber washer. 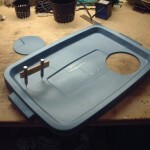 Use a slot screw driver to push the washer up against the silicone surface gently – then silicon the second rubber then attach the drain fitting to the storage device pail -bucket – etc. 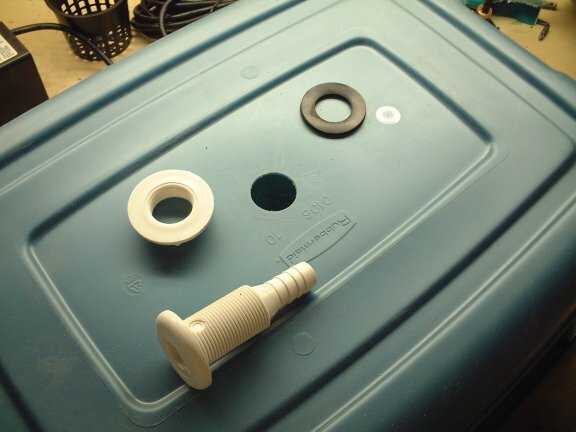 Remember the rubber fittings against the flange go on the inside of the pail…Watch it closely as you tighten the nut on this fitting – the silicon will have a lubricant affect and over tightening may cause the washer to slip out – you can tighten more if needed when the silicon is set. 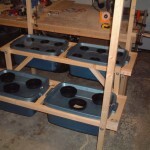 Installing the aeration system under the lids in the chamber of the roots, I did not want to use metal – In this system — there will be no contact of metal with solution period… So I came up with a push fitting using the plastic pex fittings with pex pipe – these are very cheap for me so I use them. First if you put a pex (from now on it is assumed plastic) fitting in to the pipe it is not very snug. So if you want it more snugger…lol… you will need to wrap it with Teflon tape – BUT if you push it in to pex pipe it rips the Teflon tape and the seal is compromised. 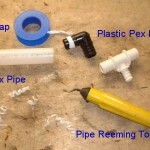 So – use a means by which to camber or bevel the inside edge of the pex pipe, I use the yellow reamer. 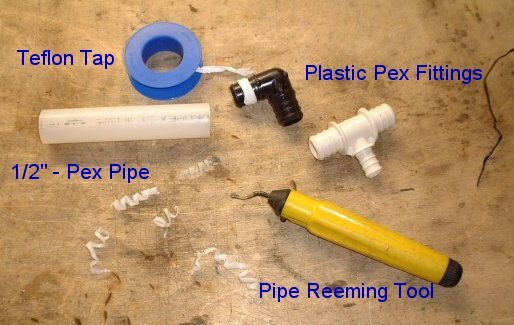 I use the reamer to bevel the inside edge of the pipes to allow the Teflon taped fittings to insert in to the pex pipe with little damage to the seal. A little lubricant is ok like a very very very tiny amount twisted on to the tape on the fitting will encourage the seal but very very little is needed…It never hurts to expose the pipe to hot water to make it pliable. 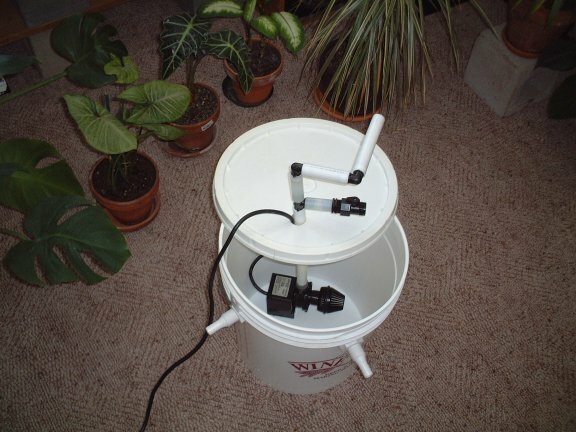 The nutrient pump in an old Wine Kitz primary fermenter, or just call it a 5 gallon bucket… After the plug and 3/4″ pex and an air hose is feed through the hole in the lid there is little room for anything else. 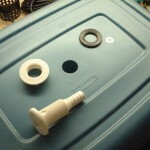 There is a shut off valve on the riser off the pump I am going to use it for discharging the reservoir. 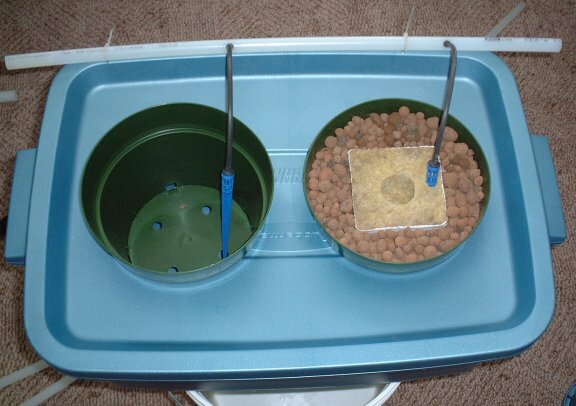 In the yard there is a drop in elevation of at least 4 feet with out setting up a level and transom so siphon action should help speed this up, I will probably put in a shut off on the feed side to assist flushing out the nutrient solution every 10 to 14 days.